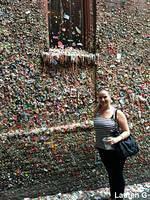 One of our friends, Lauren G, went to Seattle to visit family. While there she took several pictures of some of the weird attractions in the city. Special thanks to Lauren for providing us with these pictures! 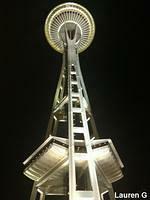 Some of you may think interesting attractions in Seattle start and stop at the Space Needle. 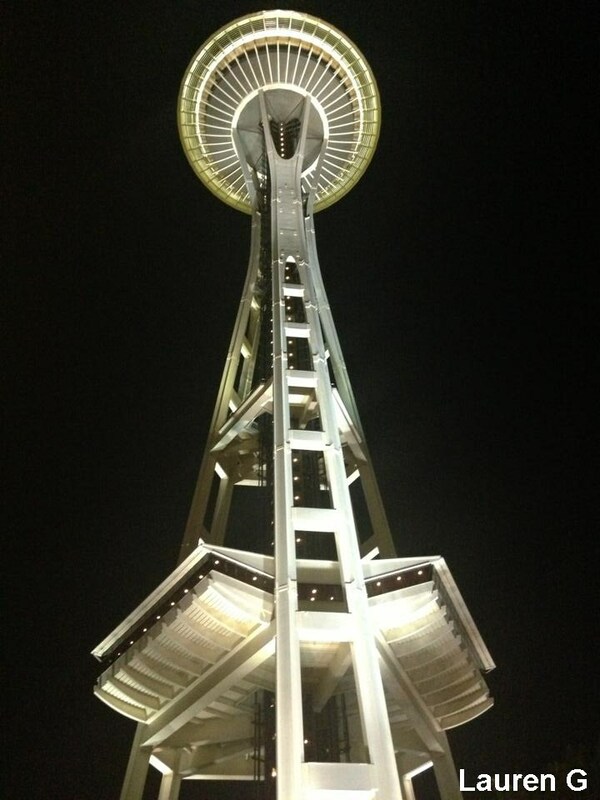 And at 605 feet tall, with 25 lightning rods mounted on it, and able to resist a 9.1 magnitude earthquake, it is a pretty impressive attraction. But there are several other more unique attractions in the Emerald City called Seattle. 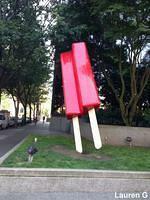 Located on the southwest corner of Fourth and Blanchard in the Belltown Neighborhood of Seattle is a giant red Popsicle. Standing seventeen feet tall, it was created by Catherine Mayer in June 2011 out of steel. 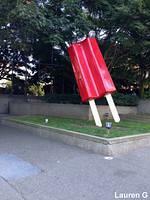 It sits on the property of real estate developer Martin Selig, who is Mayer's husband. 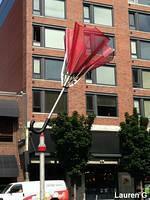 Where Lenora Street meets Western Avenue and Elliot Avenue stands a giant thirty foot high inside out red umbrella. 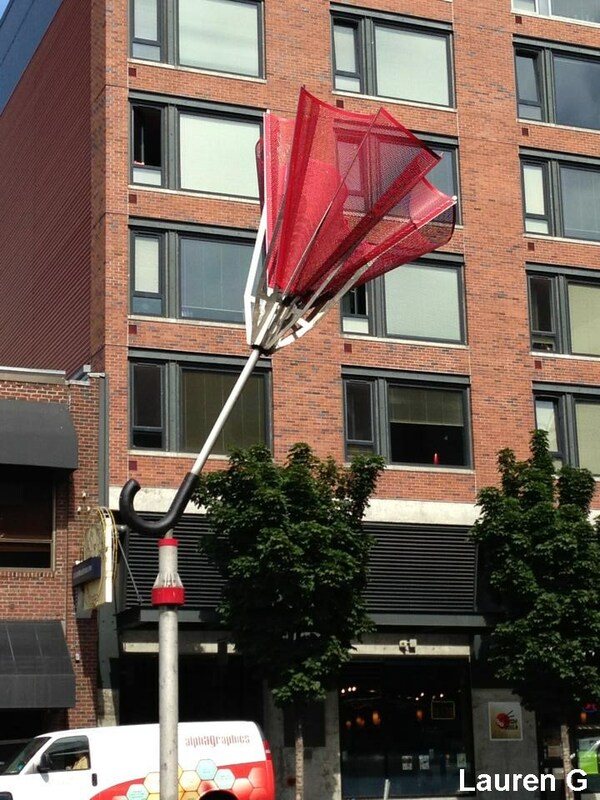 It stands in the middle of an island and apparently marks the dividing line between Belltown and Market. 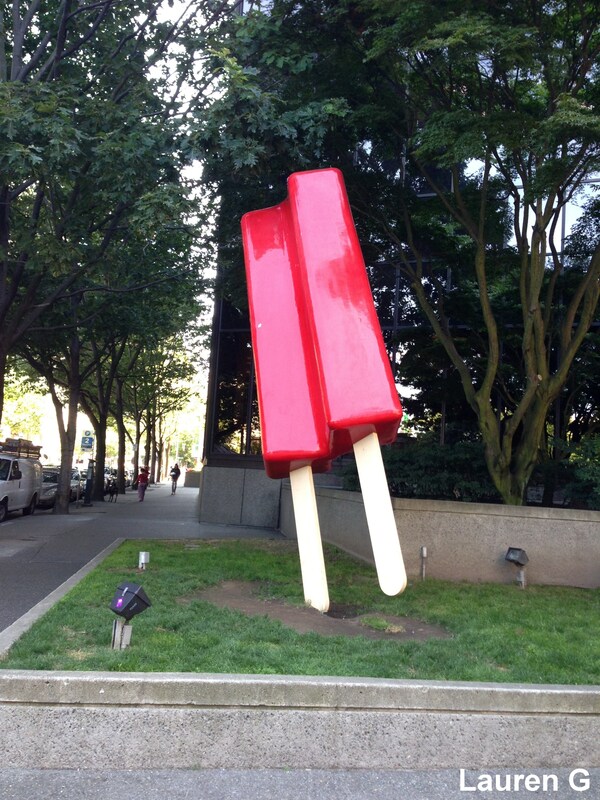 The artwork was created in 2003 by Jim Pridgeon and Benson Shaw. It was named after Pridgeon's mother and can rotate 360 degrees. 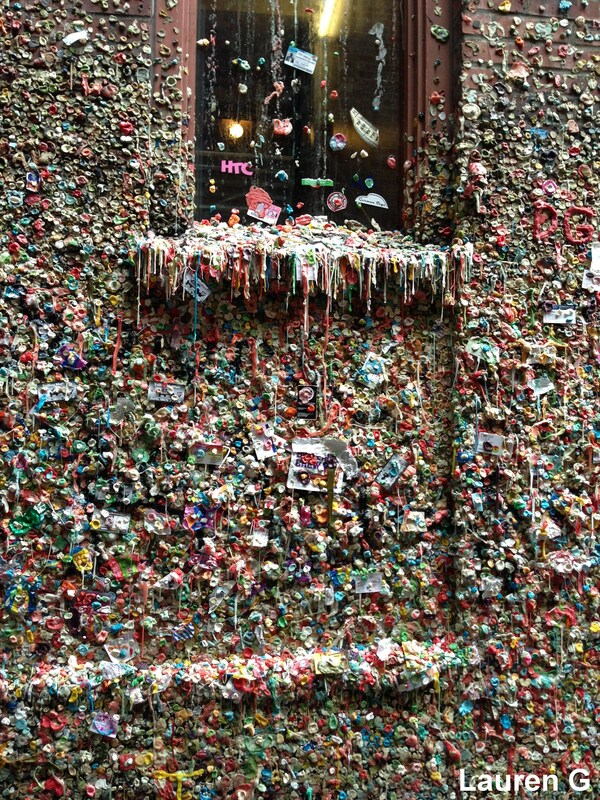 In Post Alley, the walls for about fifteen feet high and fifty feet long are slathered in several inches of chewing gum. Located under Pike Place Market, the wall sprung up in 1993 when attendees of a improvisational comedy company now known as Unexpected Productions began to stick gum to the Market Theater wall. 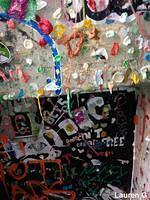 The theater tried to remove the gum twice, but gave up in 1999. 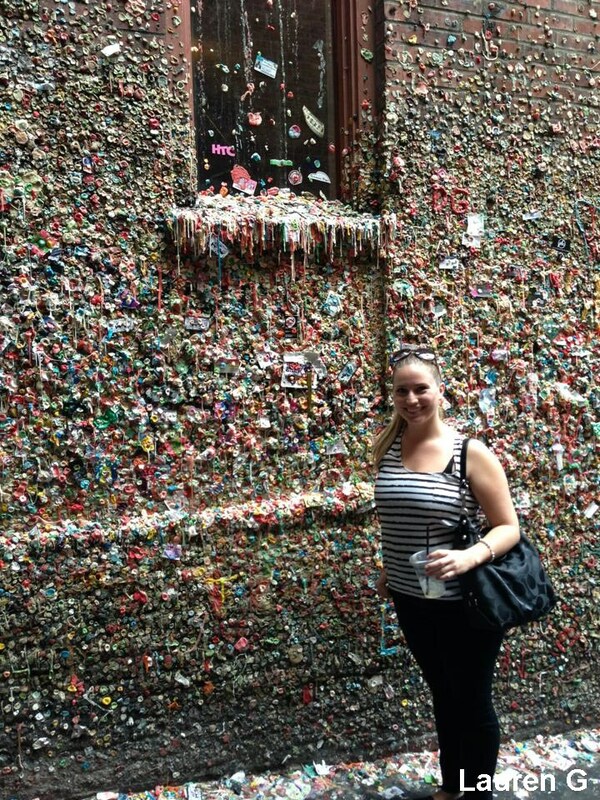 Although not as old, it is very similar to Bubblegum Alley in San Luis Obispo, CA. 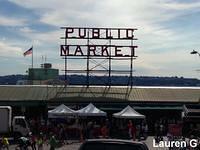 Pike Place Market opened in 1907 is one of the oldest continuously operated public farmers' markets in the US. 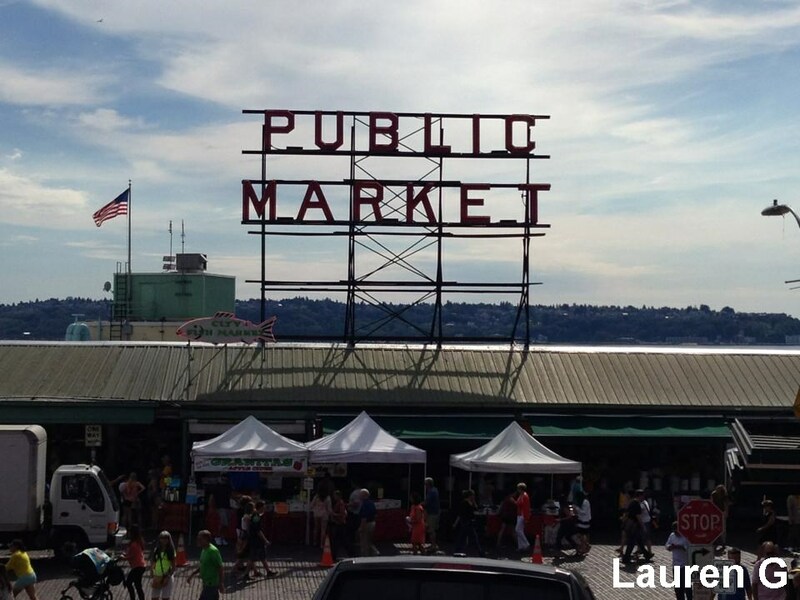 The market's mascot is a bronze 550 pound pig named Rachel which has been located under the Public Market Center sign since 1986. The Fish Market portion of the area is known for hurling fish from one employee to another. Additionally the very first Starbucks store is located in the market. Just north of the Fremont Bridge is the Fremont area of Seattle. 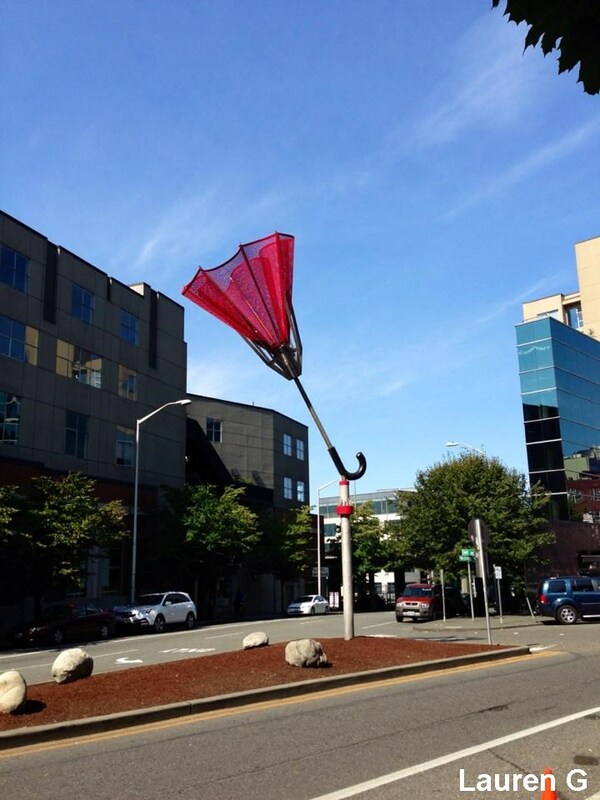 The Fremont area of Seattle has declared itself an Independent ImagiNation, separate from Seattle, and also the Center of the Universe (California only has the Center of the World, so take that California!). In this Independent ImagiNation, there's the Center of the Universe Guidepost, a bronze sculpture of Vladimir Lenin, the oft decorated Interurban Statue, a statue of a rocket, and America's Largest Troll. 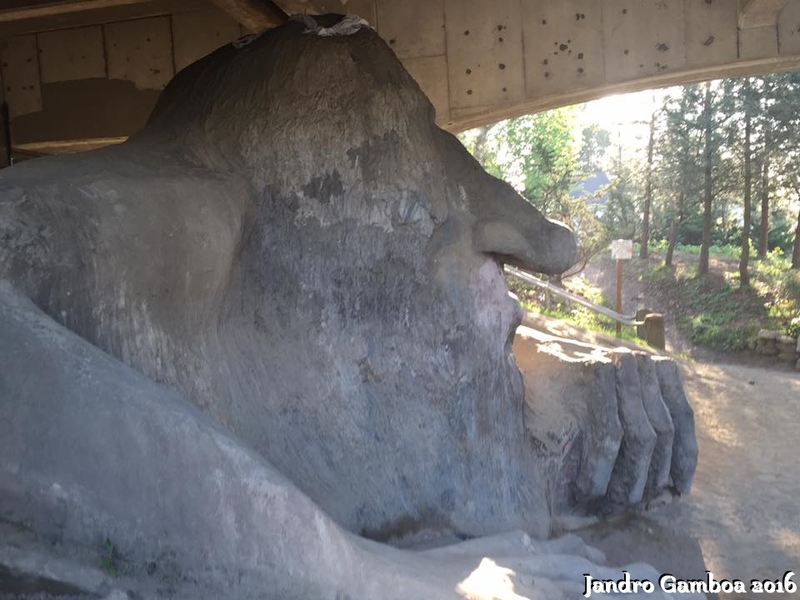 America's Largest Troll sits under the other nearby bridge, the Aurora Bridge, getting ready to emerge and charge a toll on those who pass overhead. The statue, referred to as the Fremont Troll, named after the city district despite that it sits under the Aurora Bridge and not the Fremont Bridge, is about eighteen feet tall, weighs about 13,000 pounds and was built by a team of four Seattle area artists calling themselves the Jersey Devils: Steve Badanes, Will Martin, Donna Walter, and Ross Whitehead. 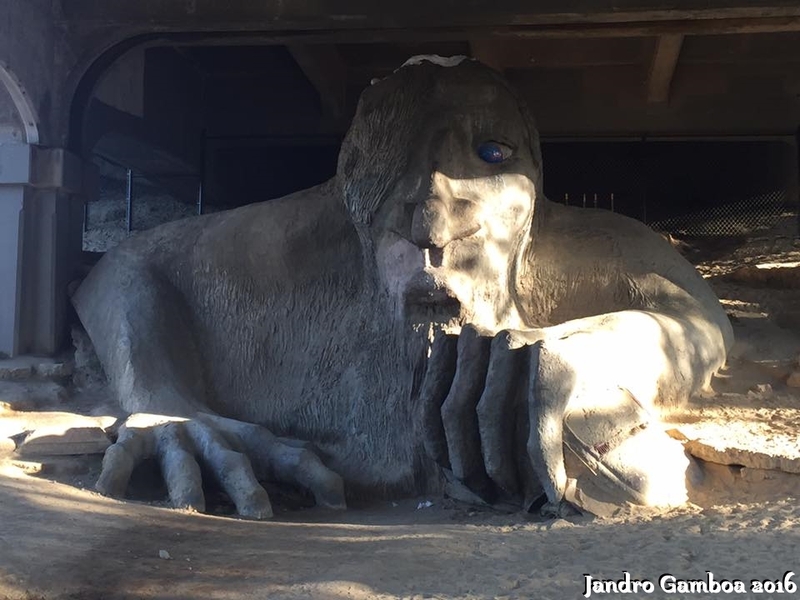 The sculpture has been there since Halloween 1990 and can be found under Aurora Avenue on Troll Avenue around 36th Street. 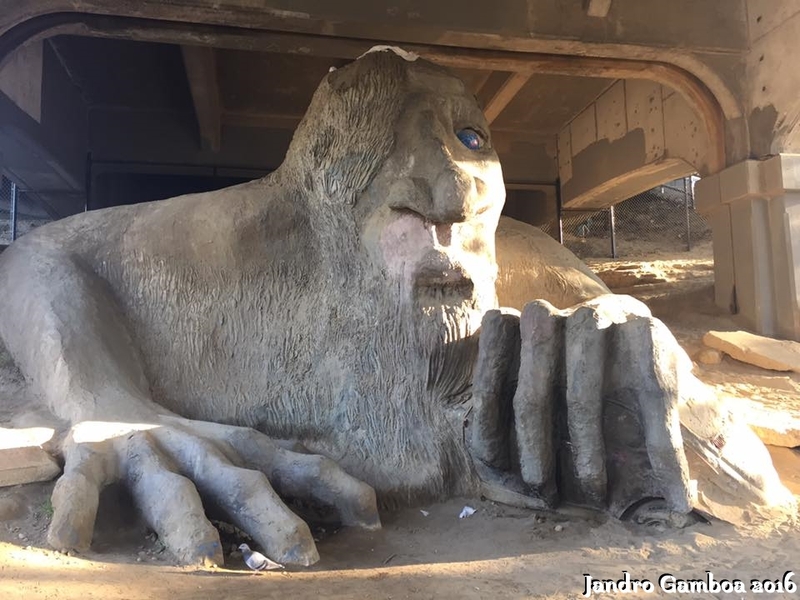 The troll clutches in its left hand a Volkswagen Bug, which at one point had a California license plate as well as a time capsule filled with Elvis memorabilia. However, the car was vandalized, the license plate stolen, and as a result, the time capsule was relocated. 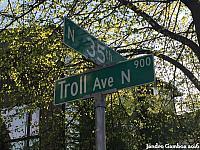 Every year, a roving Halloween party called Trollaween begins at the site of the troll. 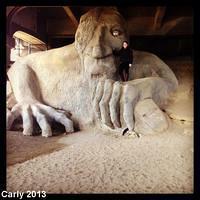 Trolls guard other bridges as well. For example in California, the Bay Bridge, which bridges the bay from San Francisco to Oakland, has a troll guarding it. And in Norway, trolls guard the Trollstiegen road which crosses the Stigofssen falls. 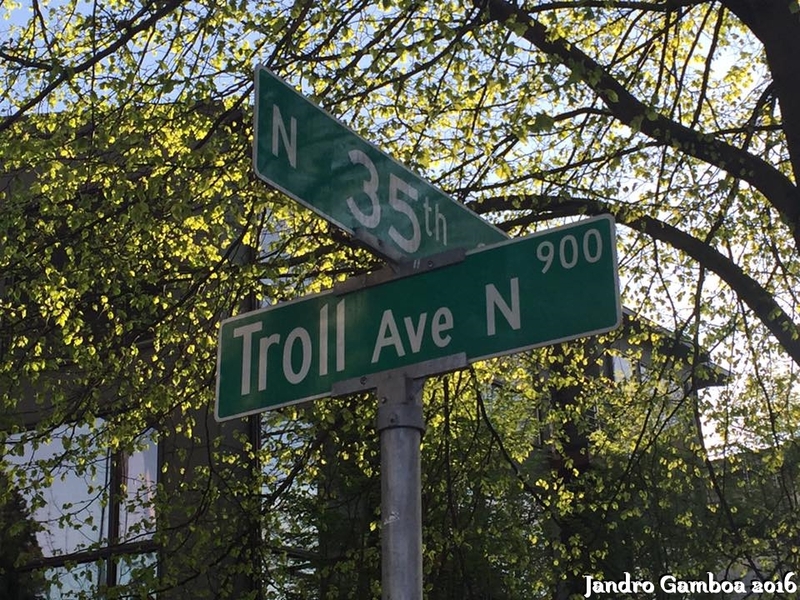 The road even has a "Troll Crossing" sign. Troll pictures courtesy of Jandro Gamboa. Check out his Instagram account Forgotten California to see more pictures of abandoned and forgotten sites throughout California! 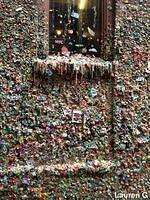 Other noteworthy weird items found in Seattle includes the Seattle Underground Tour. Seattle at some point in its history decided to raise all the streets up one level, and so the buildings that existed already suddenly had their first floors become basements; their old sidewalks became tunnels underground, and an entire network of rooms, underground paths, and warrens was born. The previously mentioned Fremont Bridge has towers over-looking it. Inside at least two of them are neon artworks. The northwest tower has a Rapunzel with long neon hair and another tower represents Kipling's tale showing How the Elephant Got his Trunk. The Fremont Bridge is the most opened drawbridge in the US, and it opens, on average, about thirty five times a day. Outside 918 East John Street is a mysterious old style Coke soda machine that somehow manages to get restocked. It just sits outside a key shop, oddly out of place and time. As if it wasn't mysterious enough, it even has a Mystery question mark button, that when pressed dispenses sodas that aren't amongst any of its other options. On 46th Street, there's a huge mall with a small part taken out of it. In that hole, lies a tiny little house that once belonged to an old lady named Edith Macefield. She is thought to possibly be the inspiration for Pixar's "Up" movie as she refused to sell when the mall was being constructed. 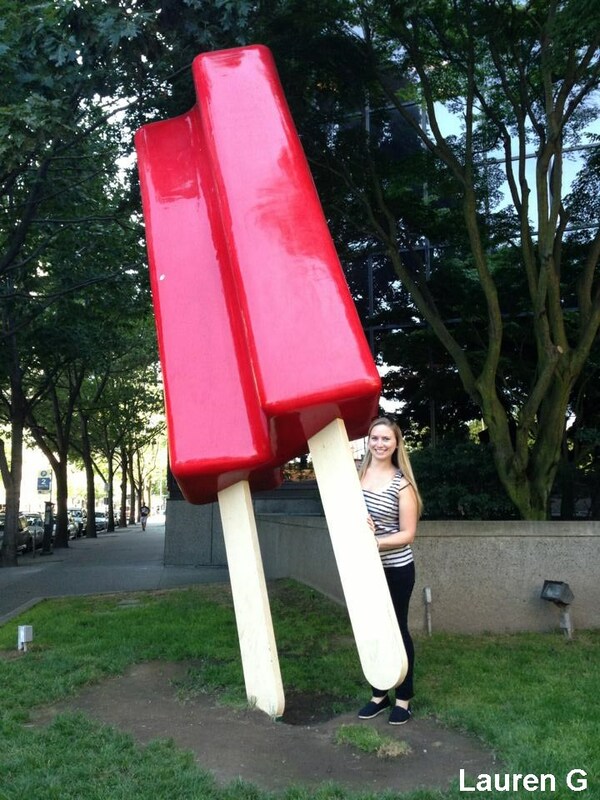 She sadly later passed away, leaving her house to the construction chief responsible for building the mall. The house still stands surrounded by the mall, although there are plans to turn it into a park of some sort.